Nokia’s share of Windows Phone 8 devices has been growing steadily over the last few months, moving from about 75 percent at the start of the year, to a new high of 90 percent this month. 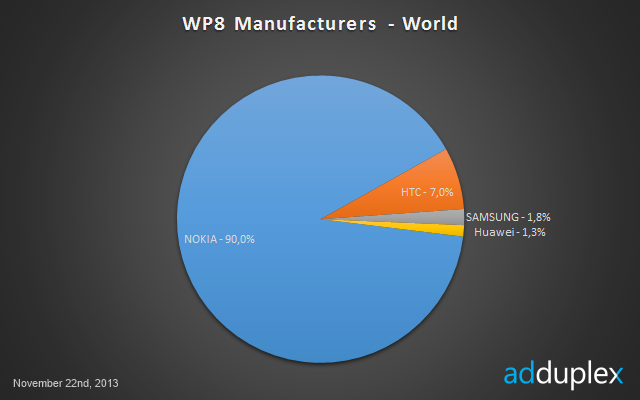 This means only 1 out of every 10 Windows Phone 8 devices is not a Nokia Lumia. 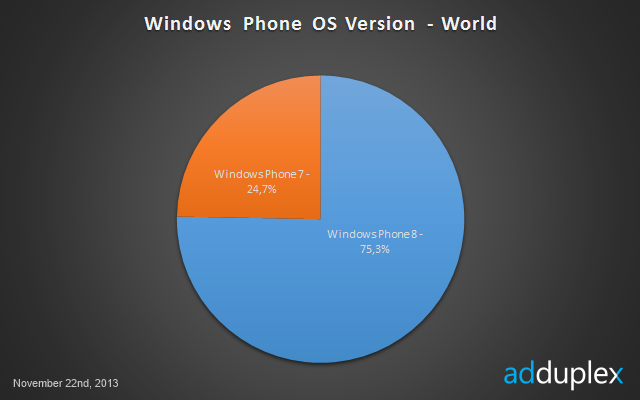 These latest estimates are based on usage data from AdDuplex, a popular ad network for Windows Phone. While the numbers are of course skewed to devices that view content with ads (the results are based on data collected from 2,087 Windows Phone apps running AdDuplex SDK version 2), Nokia’s rise in the Windows Phone world isn’t much of a surprise. 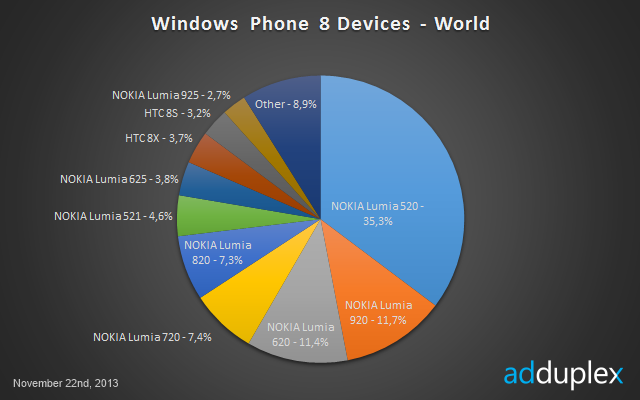 Unsurprisingly, the most popular device is still the Nokia Lumia 520. Back in July, the device stole the crown from the Lumia 920, and it doesn’t look interested in relinquishing it anytime soon. It therefore should surprise no one that Nokia today announced the Lumia 525, an upgraded successor to the Lumia 520. The new device upgrades the processor to a 1GHz dual-core Qualcomm Snapdragon and the memory to 1GB of RAM, but keeps all other specifications the same. This skewing towards the low-end could be a potential problem for Microsoft, which is acquiring Nokia’s Devices & Services division next year. The company will not only have to convince other manufacturers to continue supporting Windows Phone, but it will have to boost its high-end offerings if it wants to push the brand forward. While that’s not as bad as Android, Microsoft definitely has work to do. We’ll continue watching this space closely.